Here's a t-shirt design I did for the band Hell's Information. It portrays the end result of the "Rad Battle" depicted on the cover of their LP (which I also drew). I need to get the scan of the record cover and post it here soon. 666 411! 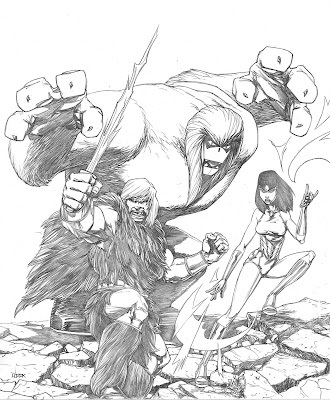 Here's a pin-up of Thundarr the Barbarian with his best buds Princess Ariel and Ookla the Mok. I'm currently working on an comic book adaptation of the episode "Wizard Wars" from 1981. It was on YouTube at one point so I watched it and transcribed/outlined it and worked from that as a script. In researching the history of the series I discovered that Jack Kirby was the main character and set designer for the series (and it shows). It was Alex Toth, however, who designed the three main characters. 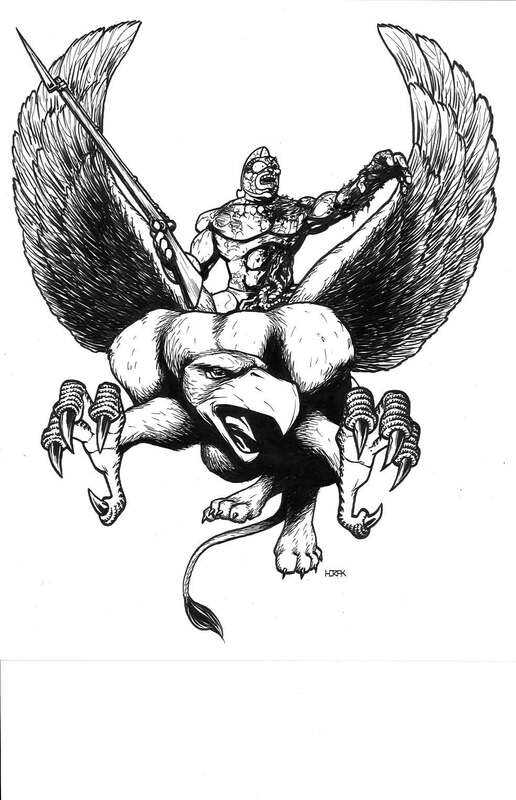 Writers on the show included Mark Evanier and Roy Thomas and the series was created by Steve Gerber. I had been trying to find something new to work on and didn't want to do a sample script but didn't want to do something totally from scratch either. So I'm doing this. I already have a good handful of pages done and will be posting those soon. A strange new world arises from the old. A world of savagery, super science, and sorcery. 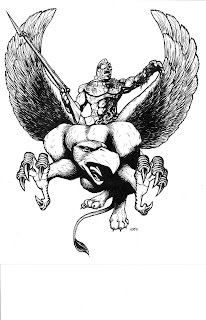 But one man bursts his bonds to fight for justice!With his companions Ookla the Mok and Princess Ariel he pits his strength, his courage, and his fabulous Sunsword against the forces of evil. HE IS THUNDARR THE BARBARIAN!"